On Monday, September 4, 2011, TradeJustice activists had a surprise encounter with Congressman Steve Rothman while petitioning against the Colombia, Panama, and South Korea Free Trade Agrements at the Labor Day Street Fair in Rutherford, NJ. TradeJustice's allies on Capitol Hill believed that Rothman was leaning towards voting for the Korea FTA, despite the fact that many jobs in his own district would be lost as a direct result of the FTA's pasage. With an estimated 45,000 in attendance, almost all of whom lived in Rothman's district, the event presented an ideal opportunity to distribute fliers and get constituents to sign postcards to Rothman against the FTAs. Thus, three TradeJustice activists, including Adam Weissman and xxxxx of Global Justice for Animals and the Environment and Juyeon Rhee of Nodutol for Korean Community Development attended the fair and succeeded in encouraging hundreds of Bergen and Passaic County, NJ residents to sign cards to Rothman. We focused our message for the day on how free trade agreements will expand factory farm agriculture, leading to the spread of more dangerous diseases like bird flu and swine flu. To our surprise, Rothman himself was in attendance. He had a booth at the event and was standing a few blocks from it, accompanied by staffers giving out pens with his name on them.The activists gave Rothman's booth an information packet about the FTA and filled out a form requesting a meeting with him. Juyeon and Adam separately approached Rothman to urge him to vote against the FTAs and to request a meeting with him. Later, Adam introduced himself and TradeJustice to Rothman. He gave the Congressman a copy of the packet of materials about the FTA he'd earlier given Rothman's booth and told Rothman that TradeJustice would very much like to meet with him to discuss our views on the three FTAs. Rothman told Adam that he'd spoken to many trade groups, both for and against the FTAs and that he'll be voting against the Panama and Colombia FTAs, but wasn't so sure on Korea. He said that he's voted against many of these, so if he has to vote for one of them. Rothman explained that he'd previously had a different position on the Korea FTA until United Auto Workers and the United Food and Commercial Workers came out in support of it. When Adam reiterated that TradeJustice would like to meet with the Congressman, he was directed to Rothman's scheduler, who was standing next to him. The scheduler gave Adam a business card. Thereafter, the activists continued petitioning for the rest of the day, collecting hundreds of signed cards from Rothman constituents. 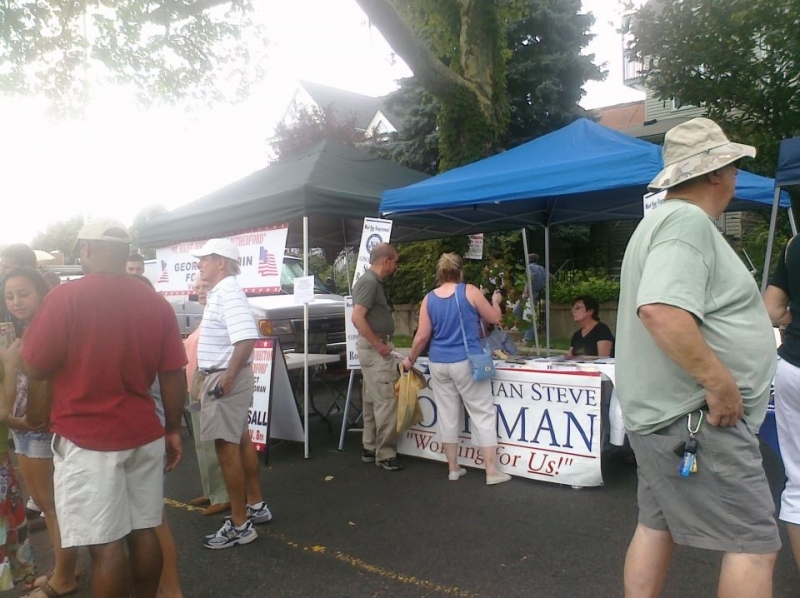 One area of the street fair was devoted specifically to booth for political parties, election campaigns, elected officials, and activist organizations from across the political spectrum, including the Reform Party of NJ, The NJ Tea Party, the NJ Independents, NJ Peace Action, Hackensack Riverkeeper, and various Democratic and Republican organizations and officials. Adam spoke to almost all of them. The Reform Party was especially enthusiastic and interested in joining TradeJustice's efforts. Even Tea Party and Republic reps expressed interest when Adam explained that many conservatives and libertarians, including Congressman Ron Paul, had expressed serious reservations about the Panama, Colombia, and South Korea Free Trade Agreements.